Nine-and-a-half years is a long time. That's how many years apart these two girls of mine are. Lily is in and out all the time, rushing from school stuff to work stuff to fun stuff, and Eve is usually home. Occasionally, their paths cross, and I love these moments they spend together. I think Eve even won this game. 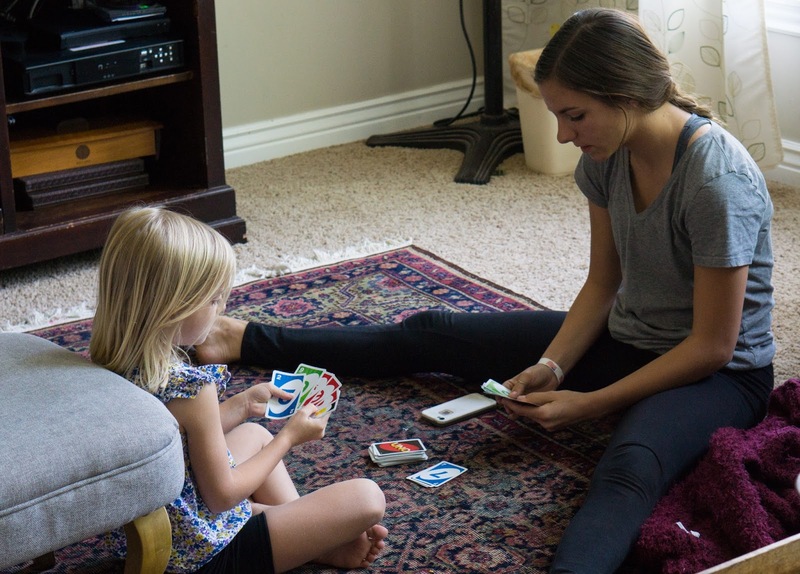 She's got a wicked good Uno game. Another night I took both of them and Lily's friend to see a Broadway touring company's version of "Beauty and the Beast." It was absolutely spectacular--the costumes, the sets, the voices. Eve managed to stay awake for most of it, but I remember she missed the Beast's transformation into the Prince. When the smoke cleared and the lights came up, Lily and I both looked at each other and said, "That's the prince? Meh. A little bit of a disappointment." Guess you can't always have mad dancing and vocal skills AND be drop-dead attractive. But it was the best production of the show I've ever seen. Ah, little girls. I love being their mom. I love tucking this littlest one into bed at night. I love talking with the bigger one when she comes bursting through the door just before curfew, bubbling over with excitement and adventure to share with me. *And thank you, Maurice Chevalier. I remember watching Gigi over and over with my mom. 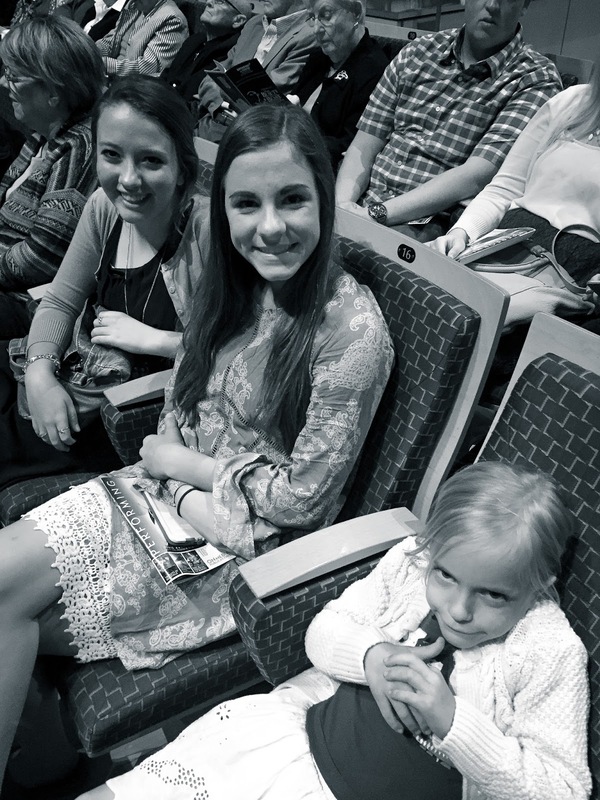 We are lucky to be the mothers of daughters. I know that for sure. Maurice Chevalier - yes, I remember Gigi - watched it many times too. My almost six year old daughter is 8, 13 and 17 years younger than her three older brothers. It's a rare occasion when they're all here together. They all love each other and get along well thankfully. Adding a girl to the mix definitely shook things up around here. 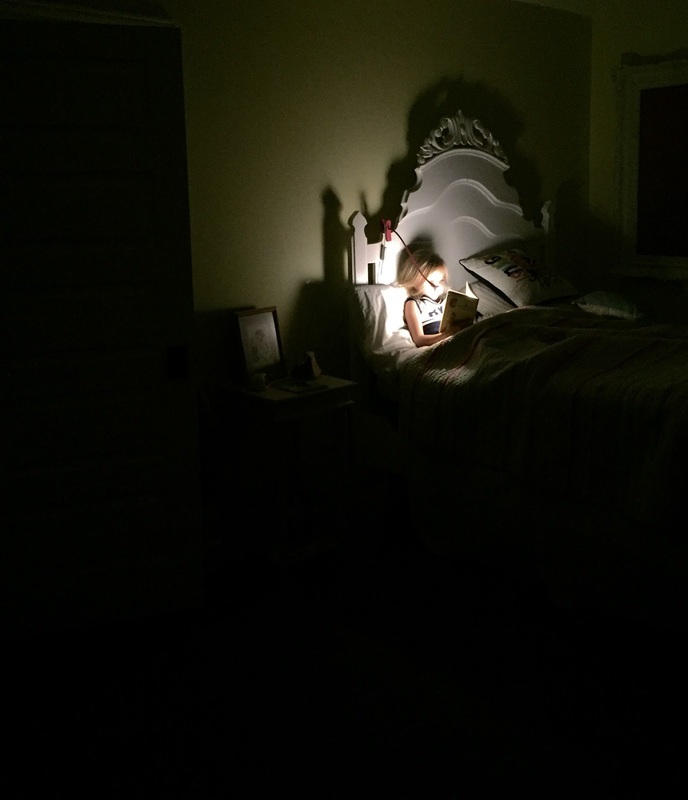 :) Love the photo of your little one reading in bed!! Happy Sunday! !